Platform beds are simple and beautiful and come in many different styles. You can create a contemporary, streamlined bedroom environment making any bedroom appear larger. 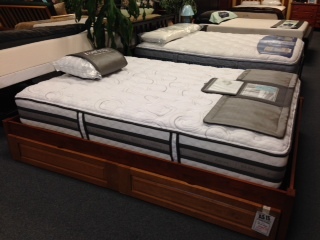 The beds are available in both metal and wood styles to compliment any bedroom. Originally platform beds were created to give an alternative and inexpensive bed too put a futon mattress on. Today they are made to accommodate a traditional mattress too. The addition of memory foam, gel foam, and latex materials along with non-spring mattresses are a perfect match for a platform bed.